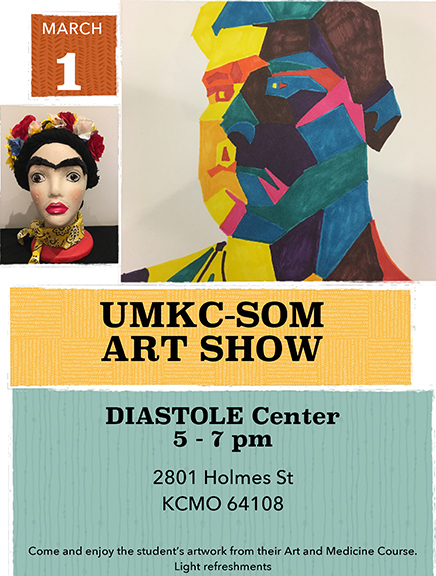 Students from the School of Medicine’s Art and Medicine course will display some of their original artwork during a School of Medicine Art Show on March 1 at Diastole. The art show will take place from 5-7 p.m. All School of Medicine faculty, staff and students are invited to attend. Light refreshments will be provided. Michael Green, M.D., physician and bioethicist at Penn State College of Medicine, presented the 2017 William T. Sirridge, M.D., Lecture in Medical Humanities. 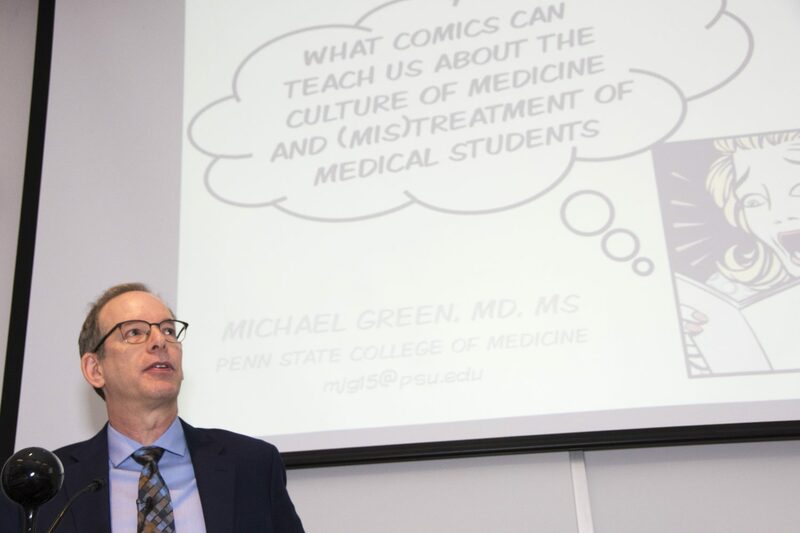 At the Penn State College of Medicine, Michael Green, M.D., a physician and bioethicist at Penn State University’s Milton S. Hershey Medical Center, uses the medium of comics to help medical students share their experiences of medical school. Each year, Green, who is also the vice chair of the Department of Humanities, offers a seminar-style class in which students are encouraged to create their own comic book to describe their time in medical school. Green presented the 23rd William T. Sirridge, M.D., Medical Humanities Lecture on Thursday, March 16, at the UMKC School of Medicine. He described how comics have become mainstream in today’s culture. He said today’s comic strips and entire comic books touch on almost every topic in all genres. “So it’s not surprising then that there would be some comics that have some relevance to medical education as well,” Green said. That has led Green to offer a four-week course in Graphic Medicine, an Intersection of Comics and Medicine. And while a large number of his students’ comics describe and depict good experiences as medical students, one serious theme has surfaced: medical students being mistreated by their superiors. Such experiences are supported by data from the Journal of the America Medical Association, which found that nearly four out of every 10 students surveyed say they have experienced mistreatment in medical school. Only half say they report it, out of fear of retribution. According to Green, these numbers have remained consistent in surveys taken throughout the past five or six years. And the data is relevant, he said, because it goes on to show that those who experience mistreatment as medical students have twice the rate of burnout as other medical students. “It is something we should care about and think about,” he said. Nearly one-third of all kindergartners in the United States begin school without the basic language skills necessary to learn to read. The Medical Humanities Interest Group at the School of Medicine is doing its part to help change that with a book drive through July 10. 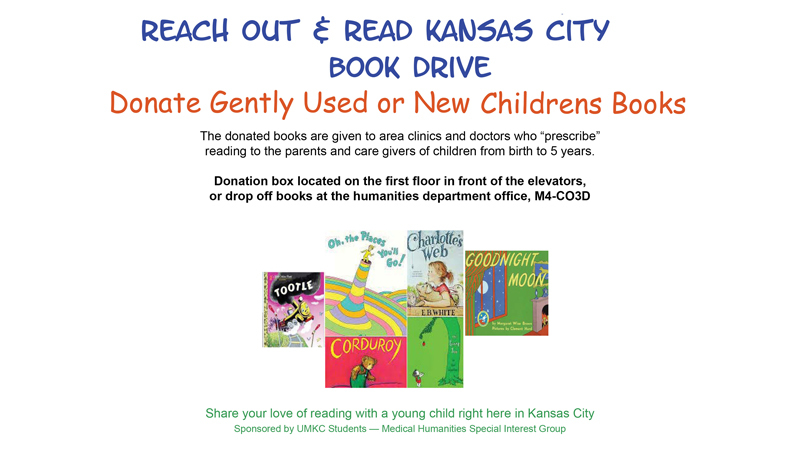 The student group will be collecting new and gently used children’s books to donate to area clinics and doctors’ offices. Last year, the American Academy of Pediatrics released a policy statement recommending that parents and caregivers should read to children from birth to 5 years old. Books will be collected in a donation box on the first floor of the medical school near the elevators. Books may also be dropped off in the Humanities Department office, room M4-C03D. For additional information, contact Reid Waldman at rawthf@mail.umkc.edu. 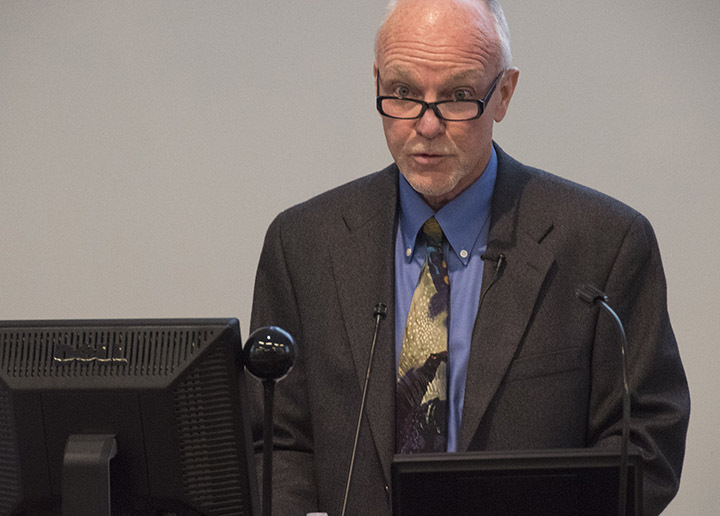 Physician and author Patrick Taylor, M.D., presented the inaugural Noback-Burton Lecture at the School of Medicine on April 28. 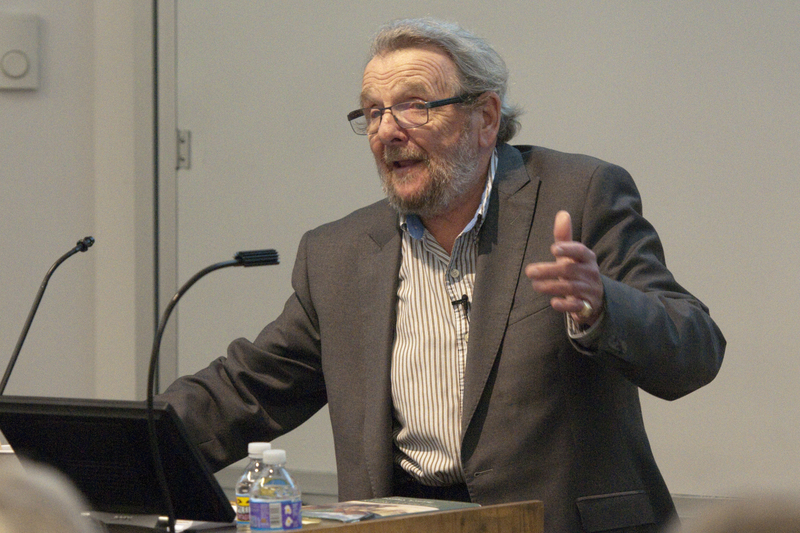 Physician and author Patrick Taylor, M.D., discussed his career in medicine and as a writer during the School of Medicine’s first Noback-Burton Lecture on April 28. The new lectureship was endowed by James Riscoe, M.D. ’75, a member of the school’s third graduating class. Riscoe said he started the event to honor Richardson K. Noback, M.D., the first dean of the School of Medicine, and Jerry Burton, M.D. ’73, a classmate who is recognized as the first graduate of the medical school. Riscoe said he chose Taylor as the inaugural speaker because the author is his favorite writer after Mark Twain. In reality, Taylor earned his medical degree in Belfast and practiced in rural Northern Ireland before specializing in obstetrics and gynecology. In 1970, he and his family immigrated to Canada where he pursued a teaching and research career in human infertility. He has received three lifetime achievement awards for his work, including the Lifetime Award of Excellence from the Canadian Fertility and Andrology Society. Taylor has written six textbooks and 170 scientific papers, and was editor-in-chief of the Canadian Obstetrics and Gynecology journal for 10 years. He began writing monthly medical humor columns in 1991 and became a book reviewer for Stitches: The Journal of Medical Humor. His series of Irish Country novels revolve around Fingal O’Reilly, an Irish country doctor practicing in Ballybucklebo, a fictitious Northern Ireland locale. The 11th book in the series is due for release in October. He has also written fiction novels about the Irish Republican Army during the late 20th Century Northern Ireland conflict, known as The Troubles. Taylor read snippets of his writings and talked about medicine in the 1930s, when his character, O’Reilly, practiced. He said that more than the science of medicine, doctors at the time practiced the art of medicine with a personal touch. Taylor said if he had a message for medical students today, it would be to have fun. “I hope your faculty of humanities will help you have a personal touch,” he said. Stuart Munro, M.D., presented the annual William T. Sirridge, M.D., Medical Humanities Lecture on March 24. Art has long been a tool used to enhance one’s understanding of the science of medicine at the UMKC School of Medicine. 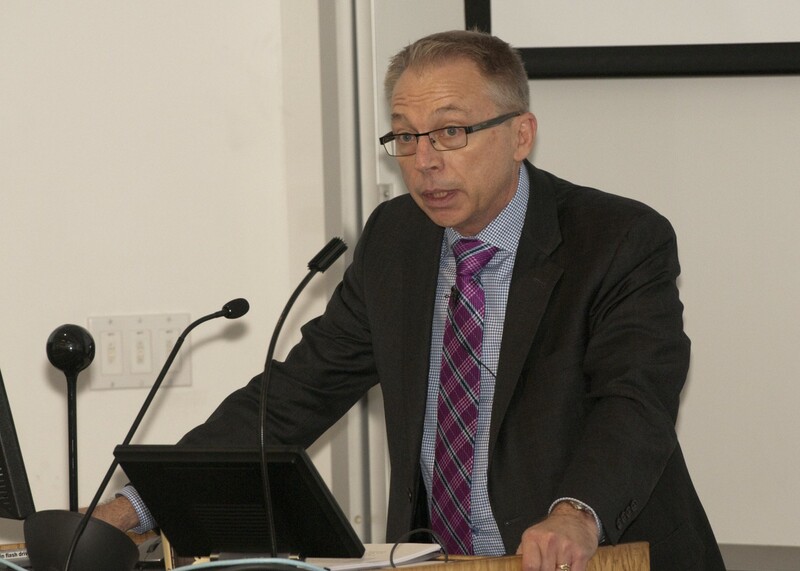 Stuart Munro, M.D., adjunct professor of medical humanities and bioethics, discussed how a balance of the two makes for a more effective physician. Munro was the keynote speaker on Thursday, March 24, for the 22nd annual William T. Sirridge, M.D., Medical Humanities Lecture. Patrick Sirridge, one of Sirridge’s four children, opened the lecture with a brief photo history of his father during his time as a physician and docent at the School of Medicine. William Sirridge and his wife, Marjorie Sirridge, M.D., served as two of the school’s founding docents. Their fondness for the arts and literature led the couple to establish the Sirridge Office of Medical Humanities. The office is now part of the school’s Department of Medical Humanities and Bioethics that was created in 2013. Munro, a long-time faculty member at the School of Medicine, served as inaugural chair of the department. He explained that in the early years of the school’s history, docents instructed students in not only the clinical skills of medicine, but also taught the basic science classes. “And I’m sure that Bill and Marjorie managed to sneak in some humanities along the way,” he said. Blending the various arts that are part of the school’s humanities curriculum with the science of medicine enables physicians to see their patients in a different light and with a fuller understanding, Munro said. He said it also helps them to grow their body of medical knowledge, while achieving greater satisfaction in their careers and personal lives. Medicine demands a balance of the two, Munro said. 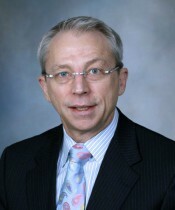 Munro joined the School of Medicine in 1985 as an assistant professor of psychiatry. He served as chair of psychiatry at the School of Medicine for nearly 12 years, and currently is course director for behavioral science and for the humanities course in music and medicine. Daniel Hall-Flavin, M.D. ’79, gave the annual William T. Sirridge, M.D., Medical Humanities Lecture on Thursday, March 26, at the School of Medicine. Daniel Hall-Flavin, M.D. ’79, says he was struck by the concept of mercy as a young medical student just getting started at the School of Medicine. 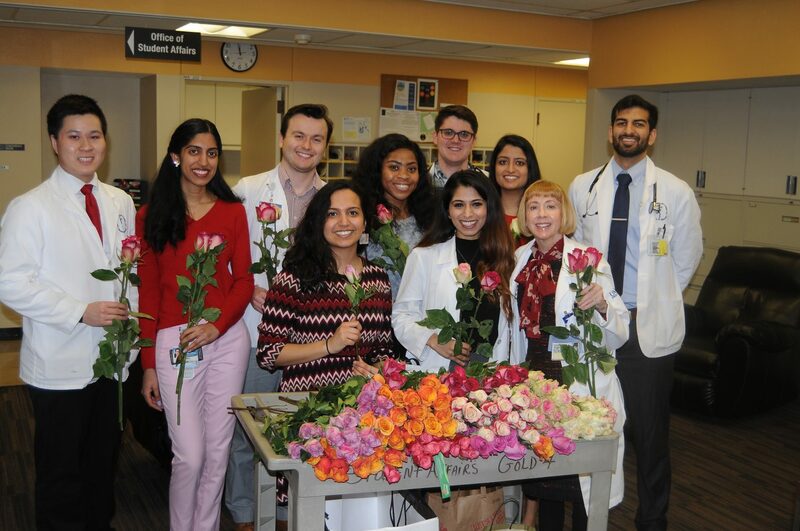 The notion of compassion toward others continued to develop further throughout his medical school career by following the lead of the school’s docents, who modeled for students a compassionate style of care. Today, Hall-Flavin shares those same characteristics of mercy and compassion with his patients and others as an associate professor of psychiatry at the Mayo Clinic College of Medicine. Hall-Flavin spoke on the Quality of Mercy in delivering the annual William T. Sirridge, M.D., Medical Humanities Lecture on Thursday, March 25, at the School of Medicine. His talk explored the meaning of mercy and its role in our traditions, the spiritual domain and in its relationship to justice. He also shared how William Sirridge and his wife, Marjorie Sirridge, M.D., who served as Hall-Flavin’s docent, taught medical students how to treat their patients with empathy. “He and Dr. Marjorie, along with other founding faculty, set the bar for docents for this medical school then, now and always for the future,” Hall-Flavin said. Hall-Flavin said that William Sirridge often shared stories of medicine and caring for patients that filled his students with confidence and good humor. “It was like being around a medical camp fire,” Hall-Flavin said. The day turned out to be an extra special affair for Hall-Flavin. Prior to giving this year’s medical humanities lecture, Hall-Flavin received word that he was selected to take part in a master’s program in medical humanities at the King’s College in London. He has been a visitor at the center for neuroethics at the University of Oxford and is currently a member of the Oxford Round Table, an organization that promotes education, art, science, religion and charity through academic conferences and scholarly papers. Daniel Hall-Flavin, M.D. ’79, associate professor of psychiatry at the Mayo Clinic College of Medicine, will present the William T. Sirridge Medical Humanities Lecture at the School of Medicine at noon Thursday, March 26. Reached by phone at the Mayo Clinic, Hall-Flavin said he planned to speak about the search for and meaning of mercy. He titled his lecture The Quality of Mercy, a nod to Shakespeare’s The Merchant of Venice. Hall-Flavin said he vividly recalls being a candidate for the B.A./M.D. program and seeing the famous passage from the play (“The quality of mercy is not strain’d/It droppeth as the gentle rain from heaven”) inscribed above the entrance to General Hospital No. 1. Preserved when the hospital was torn down, the frieze stands outside Truman Medical Center. Hall-Flavin said the marker is more than a vestige to a building that that no longer exists. “I think it’s really kind of a daily reminder to everybody who walks through those portals of what a critical role mercy and all that it carries with it plays in our daily practice,” he says. After graduating from UMKC, Hall-Flavin interned in internal medicine and trained in adult psychiatry at the Mayo Clinic. He completed a fellowship in chemical dependency at Cornell University. Board-certified in addiction psychiatry, he is involved in research that seeks to identify factors, including genetic factors, which render an individual susceptible to addiction and relapse. He also studies responsivity to antidepressant medication. Hall-Flavin said he is at a point in his career where he is able to begin to cut back on his duties at the Mayo Clinic. He hopes to use the extra time to pursue his interests in the medical humanities and bioethics. He recently applied to a master’s program in the medical humanities at King’s College in London. A frequent traveler to England, Hall-Flavin has been a visitor at a center for neuroethics at the University of Oxford and is a member of the Oxford Round Table, an American-led educational organization. Hall-Flavin said his interests in the medical humanities and bioethics are “a natural extension of how I was trained.” His docent was the late Marjorie Sirridge, M.D. Sirridge and her husband, William Sirridge, M.D., who died in 2007, worked to increase the opportunities for UMKC students to study humanities and bioethics and eventually established the Sirridge Office of Medical Humanities and Bioethics. The William T. Sirridge, M.D., Medical Humanities Lectureship was established in 1994. Nkiru Osude, MS 4, already has a head start on her upcoming role with the Student National Medical Association. Osude has spent a good portion of the past year working with the organization’s International Missions Committee to plan a medical mission trip to Haiti for this summer. She has also been selected to join the organization’s board of directors as chairperson for the International Affairs Committee at the association’s national meeting this April in New Orleans. 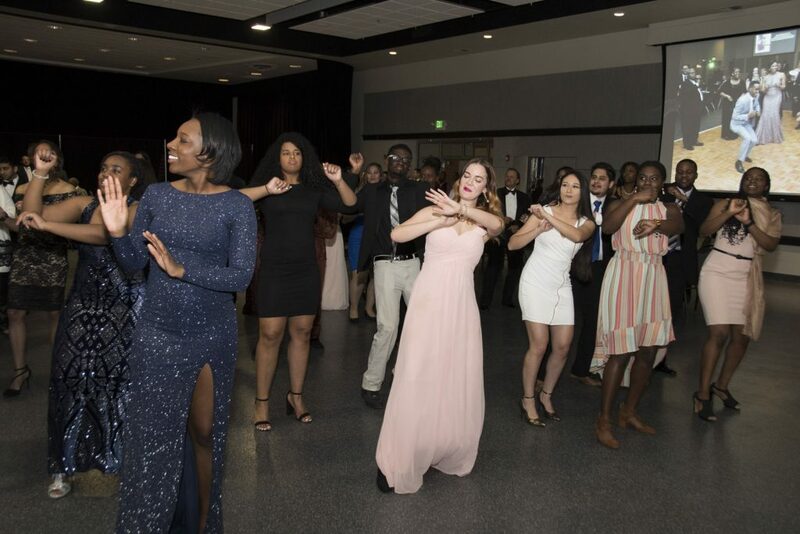 The organization is the oldest and largest minority student medical organization in the United States with nearly 8,000 members nationwide. Osude said about 20 students are members of the UMKC School of Medicine chapter. 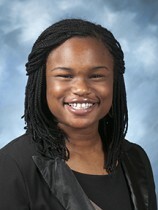 Osude became a member of the local chapter during her first year of medical school and has served in various chapter roles including treasurer and co-president. During the past year, Osude taken part in the national organization’s Future Leadership Project Fellowship, a program designed to develop future leaders for regional and national posts as well as prepare students for future leadership roles in other areas of medicine. That’s where she became involved with the International Missions Committee and began planning the medical mission project that will take place in July. The organization has partnered with the Haiti Orphan Project to work with Haitian physicians and nurses for three days in medical clinics that care for an otherwise under-served population. Osude said the project may have the largest group from the Student National Medical Association to take part in a missions trip together with as many as 15 medical students from across the country participating, including one or two students as well as herself from UMKC. Osude said she also would like to work on developing a partnership between a local organization and the SNMA that would help create programs that would prepare members for mission trips abroad.